All aircraft produce wake turbulence, which consists of wake vortices formed any time an aerofoil is producing lift. Lift is generated by the creation of a pressure differential over the wing surfaces. The lowest pressure occurs over the upper surface and the highest pressure under the wing. Air will want to move towards the area of lower pressure. This causes the air to move outwards under the wing and curl up and over the upper surface of the wing. This starts the wake vortex. The pressure differential also causes the air to move inwards over the wing. Small trailing edge vortices, formed by outward and inward moving streams of air meeting at the trailing edge, move outwards to the wingtip and join the large wingtip vortex. Swirling air masses trail downstream of the wingtips. Viewed from behind the left vortex rotates clockwise and the right vortex rotates counter- clockwise. They spread laterally away from the aircraft and descend 500 to 900 feet at distances of up to five miles behind it. These vortices tend to descend 300 to 500 feet per minute during the first 30 seconds. Light crosswinds may cause the vortices to drift, and crosswinds in excess of five knots tend to cause them to break up behind the aircraft. Atmospheric turbulence generally causes them to break up more rapidly. 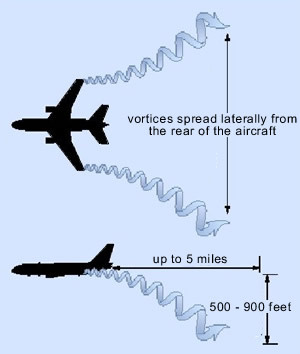 The intensity or strength of the vortex is primarily a function of aircraft weight, wingspan and configuration (flap setting, etc). The strongest vortices are produced by heavy aircraft flying slowly in a clean configuration. For example, a large or heavy aircraft, which must reduce its speed to 250 knots below 10,000 feet, while flying in a clean configuration is producing very strong wake vortices while it descends. Viewed from behind the generating aircraft, the left vortex rotates clockwise and the right vortex rotates counter-clockwise. They spread laterally away from the aircraft and descend 500 to 900 feet at distances of up to five miles behind it. Vortices tend to descend 300 to 500 feet per minute in the first 30 seconds. Helicopters also produce wake turbulence. Helicopter wakes may be of significantly greater strength than those from fixed-wing aircraft of the same weight. The strongest wake turbulence can occur when the helicopter is operating at lower speeds (20 to 50 knots). Some mid-size or executive class helicopters produce wake turbulence as strong as that of heavier helicopters. Two- blade main rotor systems produce stronger wake turbulence than rotor systems with more blades. While there have been instances where wake turbulence caused structural damage, the greatest hazard is induced roll and yaw. This is especially dangerous during takeoff and landing, when there is little height for recovery. Wake turbulence-induced roll rates can be extreme. Countering roll rates may be difficult or impossible, even in high performance aircraft with excellent roll control authority. In fixed-wing aircraft, wake vortices begin as the nose is rotated for takeoff and continue throughout flight until the nosewheel touches down on the runway once again. 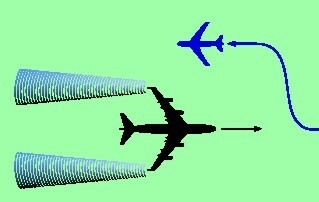 The vortices can cause problems for aircraft crossing behind or below leading aircraft. Low approaches, touch-and- goes and go-arounds can also cause problems for taxiing or departing aircraft. During takeoff and landing, the vortices sink toward the ground and move laterally away from the runway when the wind is calm. A crosswind of 3 to 5 knots will tend to keep the upwind vortex in the runway area and may cause the downwind vortex to drift toward another runway. Wake vortices sometimes bounce, diverge and dissipate more rapidly in ground effect. Wake turbulence separation is provided by Air Traffic Control (ATC) to all aircraft which may be affected by wake turbulence, except in the case of IFR aircraft making a visual approach or VFR aircraft arrivals. In these cases it is the pilot’s responsibility to provide adequate spacing from preceding, arriving or departing aircraft. Pilots should follow the guidelines below and ATC will make allowance when sequencing. Wherever practicable, aerodrome controllers will advise pilots of the likelihood of wake turbulence by using the phrase, “Caution – wake turbulence”. All aircraft types of 136,000 kg MCTOW or more. Some examples of these are: Boeing B777, B767, B747, McDonnell Douglas DC–8, MD–11, and DC–10. Aircraft types of more than 7,000 kg and less than 136,000 kg MCTOW. Some examples of these are: Boeing B727, B737 and B757*, Fokker Friendship, Metro 4 , BAe–146, Dash 8, ATR–72, Hercules, DC–3 and Saab 340. * B757 aircraft are categorised as ‘heavy’ (H) aircraft for the purpose of assessing wake turbulence experienced by following aircraft. 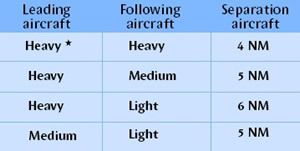 Aircraft types of less than 7,000 kg MCTOW. Some of the heavier examples of these are: Bandeirante, *Metro 3 , Cessna 402 and 421, Islander, Nomad, Piper Navajo and Beech 99. *Depending on which model of Metro, its modification status, and its operating weight on the day, it can sometimes fall into the medium category of over 7,000 kg MCTOW. This would appear to make little difference to procedural separations, but all pilots should be aware that Metro wake turbulence can have a bigger bite than might be suspected from having the type listed in the light category. After takeoff, avoid headings which cross below nd behind the path of larger aircraft. ATC applies differing separations depending on the wake turbulence category of the leading aircraft and the equipment available to them to provide separation eg, radar. The tables given below are issued by ICAO. The UK has slightly different values. * The B757 is categorised as ‘heavy’ when applying following distances. * 3 mins if taking off from an intermediate position. These are elaborated on, and there are further standards listed, in the AIP Planning Manual - such as opposite direction runway operations and crossing runways. Remember wake turbulence separation is not provided to landing VFR arrivals, nor to IFR on visual approach. In these cases it is up to the pilot to provide adequate spacing from preceding arriving or departing aircraft. If a pilot considers the wake turbulence separation standards inadequate, an increased separation may be requested by specifying the spacing required. Conversely, if pilots indicate that they will take responsibility for their own wake turbulence separation then they may request exemption from these separations. This option should be treated with caution. Another hazard to bear in mind, particularly for light aircraft, is jet blast and propeller slipstream. Beware of passing close or landing directly behind aircraft with engines running, particularly large jets. 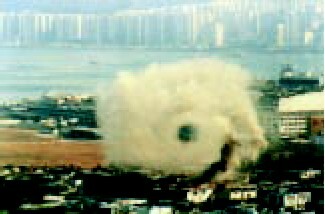 Jet blast and propeller slipstream can produce localised wind velocities of sufficient strength to cause damage to other aircraft, vehicles, personnel and buildings. Some years ago a B727 on engine tests blew in a hangar door - clear testimony to the force which can be exerted. Ensure you can rotate before the preceding aircraft's rotation point. A climb above its flight path is also necessary, until you can turn clear. If this is not possible, delay your takeoff. Avoid flight below and behind larger aircraft's flight paths. If a larger aircraft is observed less than 1,000 feet above you on the same track (same or opposite direction) adjust your position laterally, preferably upwind. 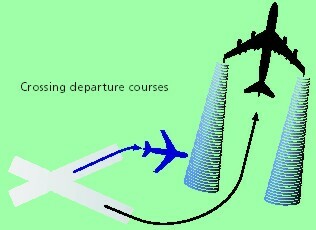 When planning to take off from an intermediate point behind an aircraft that has used full length, delay your takeoff. Air traffic controllers may separate departing aircraft by visual means after considering aircraft performance, wake turbulence, closure rate, routes of flight and known weather conditions. Controller visual separation of aircraft should not be applied between successive departures when departure routes and/or aircraft performance will not allow the pilots to maintain adequate separation. In the terminal area it must be day, the air traffic controller must have both aircraft in sight and must be in radio contact with at least one of them. The flight crew of the trailing aircraft must see the lead aircraft and be informed of the lead aircraft's position, its direction of flight and its crew's intentions. The pilots of the trailing aircraft must acknowledge sighting the lead aircraft and be instructed to maintain visual separation. The tower controller will not provide visual separation between aircraft when wake turbulence separation is required. In controlled airspace with ATC radar coverage, the controller must inform the pilot of converging aircraft and VFR traffic. In cruise, when IFR and VFR aircraft are sometimes separated by as little as 500 feet, pilots must use appropriate avoidance procedures. Because wake turbulence is nearly always invisible, pilots need to anticipate where it might be. Air traffic controllers issue "Caution - wake turbulence" warnings only and are not responsible for anticipating the existence or effect of the condition. Stay at or above the larger aircraft's final approach flight path. Note its touchdown point and land beyond it. Note wind for possible vortex drift on to the landing vector. Stay at or above the larger aircraft's final approach flight path. 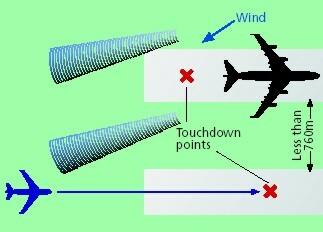 Note its touchdown point and land beyond a point abeam it. Cross above the larger aircraft's flight path. 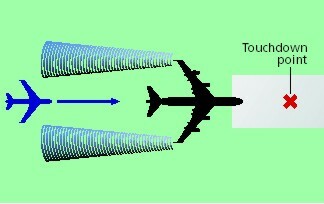 Any un-commanded aircraft movements, such as wing rocking, may be caused by wake vortices. This is why maintaining situational awareness is so critical. Atmospheric turbulence is not unusual, particularly in the approach phase. Pilots who suspect wake turbulence is affecting their aircraft should immediately move away from the wake by executing a missed approach or go- around; then must be prepared for an even stronger wake vortex encounter. The onset of wake turbulence can be insidious and even surprisingly gentle. There have been serious accidents where pilots have attempted to salvage a landing after encountering moderate wake only to encounter severe wake turbulence. Pilots should not depend on any aerodynamic warning. 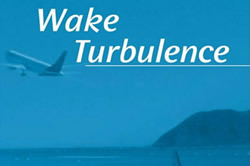 If the onset of wake turbulence is occurring, immediate evasive action is a must! *Do not get too close to the lead aircraft. *Do not get below the lead aircraft's flight path. *Be particularly wary when light wind conditions exist. Takeoff. If you think wake turbulence from the preceding aircraft may be a factor, wait about 2 or 3 minutes before taking off. Before taking the active runway, tell the tower that you want to wait. Plan to lift off prior to the rotation point of the lead aircraft, and use full takeoff power or thrust. Climb. If possible, climb above the lead aircraft's flight path. If you can't out- climb it, fly slightly upwind and climb parallel to the lead aircraft's course. Avoid headings that cause you to cross behind and below the aircraft in front. Crossing. If you must cross behind the lead aircraft, try to cross above its flight path or, terrain permitting, at least 1,000 feet below. Trailing. Endeavour to stay either on or above the leading aircraft's flight path, or upwind, or, terrain permitting, at least 1,000 feet below. Approach. Maintain a position on or above the lead aircraft's flight path with adequate lateral separation. Landing. 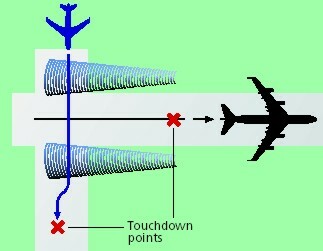 Ensure that your touchdown point is beyond the lead aircraft's touchdown point. 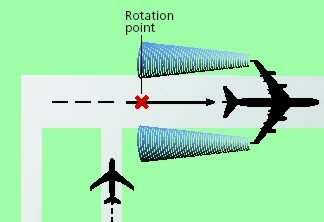 Land well before a departing aircraft's rotation point. Crossing Approaches. When landing behind another aircraft on crossing approaches, cross above the other aircraft's flight path. Crosswinds. Remember crosswinds may affect the position of wake vortices. Adjust takeoff and landing points accordingly. Helicopters. Remember that their wake vortices may be of significantly greater strength than those of fixed-wing aircraft of the same weight. Avoid flying beneath the flight paths of helicopters. When piloting a small aircraft, avoid taxiing within three wingspans of a helicopter that is hovering or hover taxiing at slow speed. Visual Approach. When making a visual approach, do not assume that the aircraft you are following is on the same or lower flight path. The flight crew of the lead aeroplane may have flown a steep approach (typical of cargo operations). Stay above and at least 3 miles behind the normal flight path (at least 4 miles behind a B757). Wake turbulence is one of the factors that pilots and air traffic controllers must avoid to ensure safe flights. It takes co-operation, awareness and an understanding of each other's requirements to safely avoid aircraft-generated wake. It is your responsibility as flight crew or pilot in command to anticipate the likelihood of encountering wake turbulence and to alter your flight path accordingly, or, if necessary, request an alternative clearance from ATC. Do not rely on others to provide warnings.